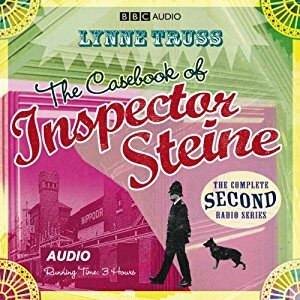 As before, The Casebook of Inspector Steine is written by Lynne Truss and produced by Karen Rose. It is a Sweet Talk Production for BBC Radio 4. Music is by Anthony May. Studio production, David Thomas. Crime has stopped in Brighton. Twitten is writing a landmark study of kinship systems in the Fens, while Steine plays golf and Brunswick auditions for the Hippodrome. Mrs Groynes is frantic to regain control of Brighton. But how can she make sure no one will ever believe Twitten if he fingers her as a criminal mastermind? With Kim Wall as Ventriloquist Vince and David Holt as an elderly stage-door man with an incredibly disgusting cough. London to Brighton has never seemed such a long way. Happening upon a furs robbery in south London, the team gives chase back to Brighton in a vintage car that travels at less than 20 miles per hour. Just the four regulars, no picnic, a hopeless quest, and a car that goes tickety-tickety-tickety-bang, for hours and hours and hours. Brunswick and Twitten have proudly organised an exhibition of criminal artifacts on the seafront. Naturally, the criminal fraternity cheerfully regards this – in the words of Mrs Groynes – as “like an amnesty, but an amnesty in reverse”. Daytrippers turn nasty. Also a small juvenile delinquent gets hold of a gun, which he fires. With Will Keen and Rachel Atkins as the incredibly annoying daytrippers, and Ethan Brooke as the lippy young Rudi. Inspector Steine receives a breathless phone call from a mysterious lady, calling from a famous girls’ school on the edge of town. A rich old girl has donated a new science block. This rich old girl is the most successful criminal mastermind in the south east: in short, she is Mrs Groynes! Brunswick goes undercover (and very nearly underwater), Twitten behaves like a teddy boy at Rock Around the Clock, the standard of schoolgirl pickpocketing skills takes the breath away, and Mrs Vine adds another broken heart to her collection. With Nicholas Le Prevost as the headmaster (“You girls!”), Michelle Tate as Phyllis, and Janet Ellis as the evil Mrs Adelaide Vine. The publication of Nancy Mitford’s famous book Noblesse Oblige sparks awareness of linguistic class indicators in Brighton Police Station at precisely the moment a man claiming to be “Lord Melamine” tries to interest Inspector Steine in buying some gold bricks at an amazing knock-down price. Is this toff what he appears to be? If he’s so high-born, why does he keep using the words “toilet”, “serviette”, “la-di-da” and “mental”? With Mark Heap as Melamine. Brighton Police Station acquires a very keen (and brilliant) police dog called Bobby. He solves old murder cases and effortlessly uncovers Russian espionage rings. He is tireless and infallible. There’s just one problem with this wonderful animal: he keeps attacking Mrs Groynes! He keeps leading the policemen straight to her door! What is wrong with this dog? What will his persistence drive Mrs Groynes to do? With David Holt as Bobby and a very special guest appearance at the end….